Wouldn’t it have been great if you had known how to research your ex’s Sexual Charisma? Hindsight is 20-20 about financial irresponsibility. But wouldn’t it have been better if you could have figured this out before that business partnership? And maybe you wouldn’t cringe at talking to a certain family member… if you only knew how to research that person’s Listening Ability. Maybe you’d know how to handle that relationship better. Plus, definitely, stop blaming yourself. Yet some of us think we don’t need some book to help us to upgrade how we read people. Why not? Because we know we’re very perceptive. Especially if you’re already perceptive, when’s the last time you upgraded your skills? This how-to book from Rose Rosetree is all about building upon the people skills you already have. Getting new skills. Better skills. Skills that can serve you well. When you learn super-effective ways to read people deeper, you can avoid many a problem. Have certain people disappointed you in the past? Are you still scratching your head in bewilderment? Use the skills in this book plus a photo. Yes, an ordinary photograph, like on Facebook or Linked-In. Then you can start researching what on earth was going on with that person. 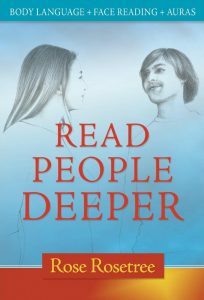 Mostly, what will you find when you read people deeper? Usually you can find a great deal of good news. Instead, what will you discover? Insights into what makes you special. And how very different you are from each other. Can this book help you transform your relationships, becoming a better judge of character than ever? Such an exciting possibility! No other book combines leading-edge knowledge about body language with face reading and aura reading. Once you go through simple how-to basics early in the book, choose from 50 categories of interest. Then research about what interests you most. This book-within-the-book would — alone — might be worth the cover price because of how much it helps you. Speaking of that cover price, it’s $14.95 for the paperback, right? Took Rose 3 1/2 years to write. Altogether, 278 pages. Just compare that to other books that you’ve got. And check out the illustrations by Meike Mueller. Plus short quizzes that help you to train your eye. Fun! Authorized editions of this how-to have been sold in China, India, Lebanon , Russia, and The Slovak Republic. Won’t your life change if you had the uncanny bull’s eye accuracy in judging people’s character? “What is needed is a deeper perception which has more than one layer,” says the author. For more satisfaction in a relationship, for example, more happiness in social life, more success at work, we need to read deeper. Part I of this book gets us started at reading people all three ways – body language and face reading apart from aura reading. We can learn by reading this book who is pretending to be a good listener, who is likely to hurt our feelings or cheat on us, who has a drinking problem, who is faithful and many more things. Discussing body language in detail, the book says that it is the study of non-verbal communication which is the best known form of deeper perception. It teaches some ways of interpreting the way a person stands, sits, points, turns, etc., how to read impartially without using any non-verbal communication as an excuse to project our feelings and set our expectations aside. For instance, the author advises that one should not go ga-ga over our date’s welcoming eyes. It is better to avoid the trap of over-emphasising body language when deeper layers of perception could be useful. In general, the use of body language is an excellent starting place to read people deeper. Thirdly, we should not over-simplify. The author gives tips and tricks for every occasion, bonus boxes for uncanny smart games that help to raise our social IQ (intelligence quotient). She gives 50 ways to read our new date or old flame, advises us to learn to catch micro expressions in an important client at work, in one’s favourite classmate at school or college and even ourselves. Face reading is best for discovering what a person does with his or her money and it supplements body language research with the 5,000-year old art of reading faces for finding out a person’s character. The author says that if you use face reading to prevent making mistakes now, you will not have to read body language about problems later. The book provides some ways to read yourself and your business associate or lover-insights that you can use right now-whether you have been together for years or months, whether you see just a twinkle in each other’s unfamiliar eyes or your situation is more like that of two people who have been “staring at each other like a pair of dead fish,” she says. So many ways to help you enjoy your life more! How to read auras from regular photos. As well as reading auras in person. Even how to read chakra databanks. Of course, this isn’t some “see the colours” kind of psychic reading. You’re learning the highly practical system of Aura Reading Through All Your Senses®. Incidentally, these are not your grandma’s scary predictions. Giving you warnings, courtesy of face reading from the old country. In “Read People Deeper” you’ll find up-to-date wisdom from the Founder of Modern American Face Reading, a.k.a., the system of Face Reading Secrets®. Think you pretty much know all about that? You might reconsider. Probably you don’t yet know… most of what you can find in from this book. Such as wholly non-visual ways that you can increase your accuracy when reading body language. What if you’re not into aura reading quite yet? No worries! Buy this book for the body language and face reading. Even if you skip over the sections on auras, you’ll still get way more than your money’s worth. “Read People Deeper” starts with how-to’s, like how to read auras from regular photos. All these instructions form Part 1. For example, Rose shows you how to avoid common mistakes people make when they read body language. How much more accurate can you be? Learn professional-level skills here. Once you go through the essential instructions, browse at will. This book makes it easy. Because Part 2 helps you go category by category. Depending on what you want to learn, you’ll go straight to what you need to notice. Such a wealth of info, yours for the taking. May it serve you well!